How do you turn plain old Brussels sprouts into a super side dish? 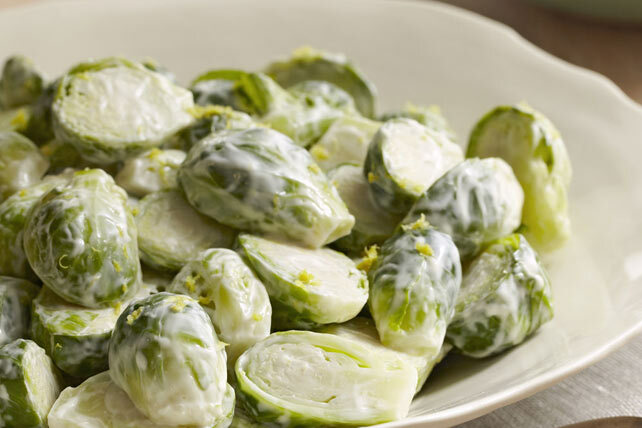 Toss hot cooked Brussels sprouts with a creamy lemon dressing and you've got yourself a versatile veggie side dish that your family will love. Cook Brussels sprouts in boiling water 8 to 10 min. or until crisp-tender. Meanwhile, mix remaining ingredients in large bowl. Drain Brussels sprouts. Add to dressing mixture; toss to coat. Substitute small broccoli florets for the Brussels sprouts. For added flavour and crunch, top with 2 Tbsp. chopped toasted pecans just before serving. Here's a tasty way to eat your vegetables. The Brussels sprouts provide an excellent source of vitamin C.